Two hundred and thirty-seven days before the Declaration of Independence was signed on July 4, 1776 in Independence Hall in Philadelphia, Pennsylvania, what would prove to be a defining moment in our country's history took place a mere two miles away. That night, November 10, 1775, at the Tun Tavern, a committee from the Continental Congress drafted a resolution calling for two battalions of Marines able to fight on land or at sea as landing forces for the Continental Navy. And with that, the Continental Marine Corps was born. 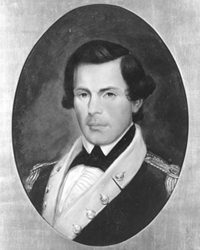 The first Commandant of the Marine Corps was Major Samuel Nicholas and his first Captain and recruiter was Robert Mullan, the owner of Tun Tavern. By early 1776, Commandant Major Nicholas had his men prepared for battle. 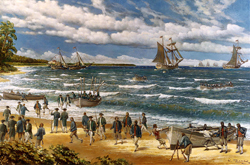 In March of 1776, Nicholas led his men on the first landing on a hostile shore in Marine Corps history when he led approximately 210 Marines on a raid of Nassau on the Island of New Providence in the Bahamas. The raid, while not as successful as initially hoped for, did succeed in capturing the town, along with a large number of guns, mortars, and gun powder. 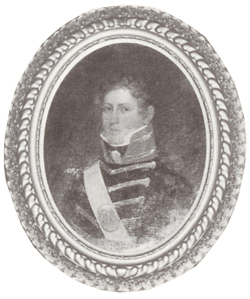 March also saw the first Marine combat death, that of Lieutenant John Fitzpatrick. A month later, in April of 1776, John Martin, enlisted to serve aboard the USS Reprisal, making him the first of at least 12 African-American Marines to serve during the Revolutionary War. In January of 1777, Continental Marines joined with George Washington's Continental Army to defeat the British at the Battle of Princeton in New Jersey, marking the third defeat in 10 days for the British, raising morale among American troops and inspiring more young men to join the fight against the British. A year later, in January of 1778, Captains John Rathburn and John Trevett led a second raid on Nassau, once again capturing it. Their victory marked the first time the "Stars and Stripes" (the American flag) was raised over foreign soil. In April of that same year, Marines under the command of John Paul Jones made two daring raids on British soil, once at the port of Whitehaven, in northwest England, the second later that day at St. Mary's Isle in southwest Scotland. In 1779 a Marine detachment secured New Orleans, preventing British traders from entering the city. While in New Orleans, Marines also led a series of raids of British Loyalists living on the shores of Lake Ponchartrain, outside the city. In 1781, the Continental Marines engaged in what would be their last official act of the Revolutionary War when they escorted a supply of silver from Boston to Philadelphia. The silver was a loan from King Louis XVI of France and allowed the Bank of North America, the nation's first central bank, to open. While the last official action seen by Continental Marines during the Revolutionary War was the escorting of the silver, the last actual action they saw was in March of 1783 during the final confrontation of the war, a duel between the USS Alliance and the HMS Sybil off the coast of Florida, 5 weeks after the war had ended. In all, over the course of 7 years of battle, the Continental Marines had only 49 men killed and just 70 more wounded, out of a force of roughly 130 Marine Officers and 2,000 enlisted. In the immediate aftermath of the war, both the Continental Marines and the Continental Navy they served under were disbanded. This lasted barely a decade until 1794 when, in preparation for the Quasi-War with France, Congress authorized the re-formation of both the Navy and Marine Corps. During the Revolutionary War, the Continental Marines' uniforms consisted of a green jacket with high leather collar, or stock, to protect the neck against sword blades. While the Marines changed the color of their uniforms to blue in 1798 (to honor their naval tradition), the stock remained a part of the Marine Corps' uniform until the 1870s. Over time, the wearing of leather stocks around the neck led sailors on the ships the Marines were serving on to refer to the Marines as "leathernecks," a nickname by which Marines are still known today. 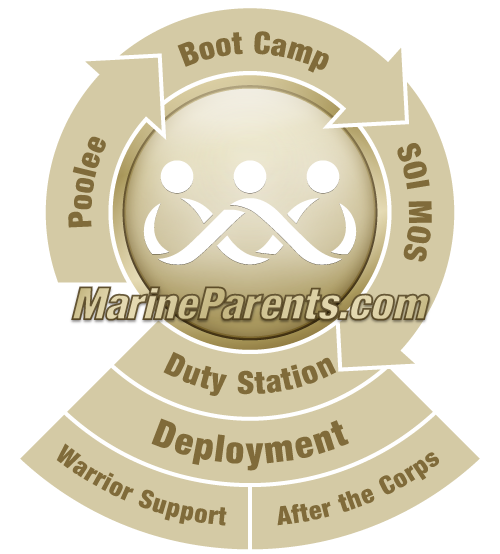 Additionally, the Revolutionary War not only led to the founding of the United States (Continental) Marine Corps, but also highlighted for the first time the versatility that Marines have come to be known for. They fought on land, they fought at sea on ships, and they performed numerous amphibious assaults (which, over time, would become one the Marine's most dangerous and defining capabilities, as would be seen in the Pacific Theater of World War II and at Inchon in Korea). "At no period of the naval history of the world, is it probable that Marines were more important than during the War of the Revolution...the history of the Navy, even at that early day, as well as in these later times, abounds with instances of the gallantry and self-devotion of this body of soldiers." 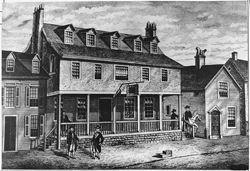 —An artist's sketch of Tun Tavern, the birthplace of the Marine Corps (image released). —Major Samuel Nicholas, first Commandant of the Marine Corps (image released). —Painting of the Battle of Nassau by V. Zveg (image released). —Sketch of the USS Alliance by Nowland Van Powell (image released). —Portrait of a Marine wearing the high leather collar from which the "leatherneck" nickname is derived (image released).